As Leonara Epstein deftly describes the campaign writing on The Frisky, "In a series of videos, we learn that Max and his Tampax friends attend a special school where they do exercises and parade around in their rainbow tampon uniforms and--what, is that a tail dragging on the ground?--oh God, it's the effing cotton string dangling between his legs." Hmm. Strange indeed. And the campaign's purpose? 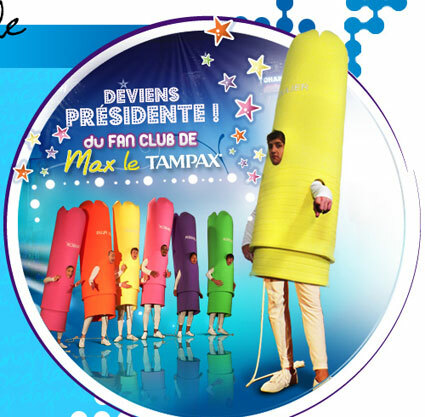 To encourage people to compete for the position of president of the Max Le Tampax Fan Club. Seriously? The president of a tampon fan club? Just what's going on over there in France?